Since inception in 2008, IPS has become a national provider of anesthesia management services for surgery facilities, pain clinics, and office based surgery centers. Our locally recruited and dedicated Anesthesiologists and Certified Registered Nurse Anesthetists (CRNA’s) provide coverage for your operating rooms, pain procedure suites, endoscopy suites and other specialty procedure rooms; while our management team takes care of the billing, recruitment, credentialing, coverage coordination and all anesthesia related operations. IPS has internationally recognized Pain Physicians in leadership roles and is associated with Pain Fellowships. Not only can your existing program continue, but the association with our Industry Leading physicians will allow the development of additional product lines ranging from non-invasive to minimally invasive spine surgery, possibly including our proprietary programs. With Fellowship trained Electroneurodiagnosticians on staff, we have resources to expand the typical Pain Practice’s reach. 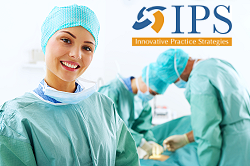 Unlike other “Consulting Firms” that simply provide advice, IPS actively participates in the development and implementation of the adjunct programs from which our associated centers and physicians will profit, not only financially, but by enhanced perception and prestige in the local and national markets. Contact the Anesthesia Experts Today! Contact us at 888-337-3509 or info@ipsmgmt.com and set up a 10-20 minute information phone discussion with our Ambulatory Anesthesia and Pain Management Team. Your center’s procedure rooms are the ONLY priority of the anesthesia team - not a secondary income for an anesthesia group subsidizing other local facilities being served by the group. Having the same dedicated staff in your center every day creates a team spirit within the group. They will learn how your physicians work, promoting a smooth process and a better experience for the patient.